The state of Colorado is mostly known for its mountains and canyons. 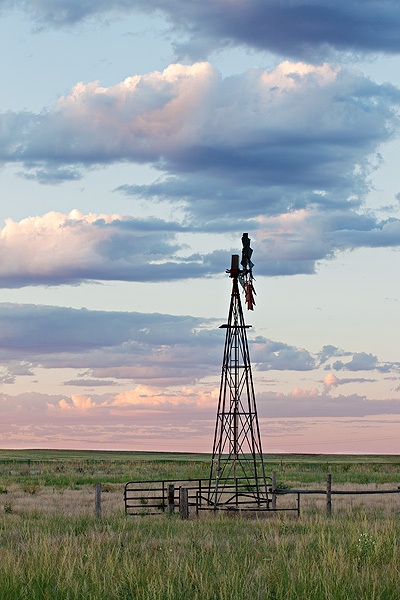 The high plains are mostly an after thought to residents and visitors to Colorado. The high plains however, offer photographers the oppurtunity to present another portion of Colorado many pass through without stopping. Windmill powered cisterns dot the eastern plains of Colorado and help to bring water to much of the livestock grazing on the vast plains. This windmill and cistern added a nice touch to a beautiful sunrise on the plains. This particular view is located near Roggen, Colorado in Weld County. Photo © copyright by Thomas Mangan.